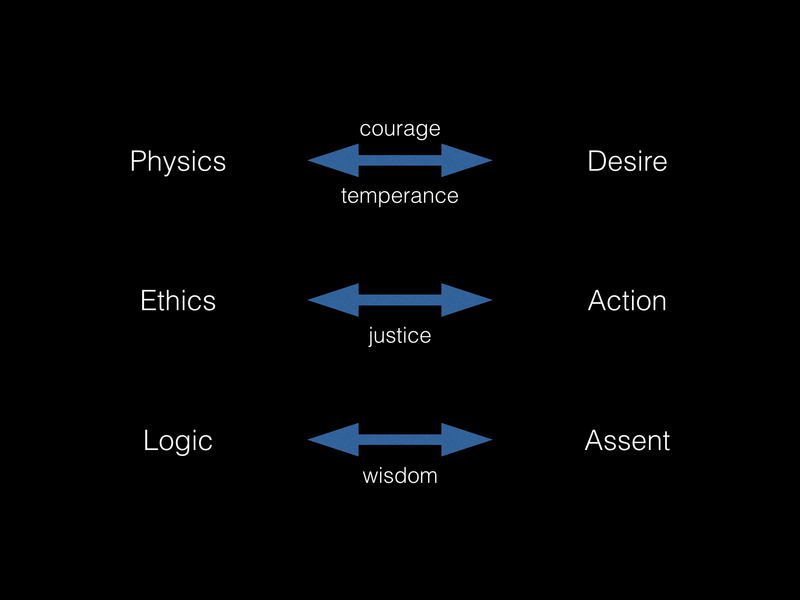 Two of the first things anyone interested in Stoicism learns are the distinctions among the three fields (i.e., logic, physics, and ethics) and the three disciplines (i.e., desire, action, and assent). One may even learn that the two sets were not, so far as we know, explicitly connected in ancient times, but that Pierre Hadot has made an excellent case for a specific pattern of relationship between them (and the four virtues), in his excellent Philosophy as a Way of Life. In this post I’d like to revisit the issue and clarify why Zeno, who originated the tri-partition among the fields, taught them in a specific sequence, as well as way Epictetus, who is thought to have explicitly introduced the three disciplines (though they were arguably implied in earlier Stoicism) thought that one of them had clear precedence over the others. Logic is the fence, and the first topos to be studied, because it provides us with the tools to carry out sound reasoning, which are necessary for an understanding of the other two pillars. Physics is next because an understanding of how the world works, including a comprehension of human nature, is necessary — according to the Stoics — to figure out how to best live our lives, which is the goal, and hence the fruit of the garden, in turn made possible by fertile soil, i.e., a proper understanding of physics. This requires some unpacking. The discipline of desire basically tells us what is proper or not to aim for (i.e., to desire), and according to the Stoics this is reflected in the famous dichotomy of control: it is proper to desire things that are in our control (because we can be certain of obtaining them), but not things that are not under our (complete) control (because therein lies uncertainty of outcome, and therefore disappointment and suffering). Things that are under our control are our judgments and our actions; things not under our control include pretty much everything else, and most especially health, wealth and fame. The second discipline, of action, regards how we should behave toward others. Here it is important to remember that the Stoics were cosmopolitan (see Hierocles’ circle), and that they adopted a strongly pro-social attitude, while not neglecting the needs of the individual. The last discipline, of assent, concerns our ability to sanction, or not, our “impressions,” i.e., the raw materials that the world presents to us before our judgment has had time to intervene. For instance, if I hear a sudden noise I may jump in autonomic reaction reflecting sudden fear. But further examination by my “ruling faculty” (as Marcus would say) discovers that it was simply the wind moving some brushes, and that therefore my initial impression (there is something out there, I need to be afraid!) was unjustified and I need to withdraw assent from it. 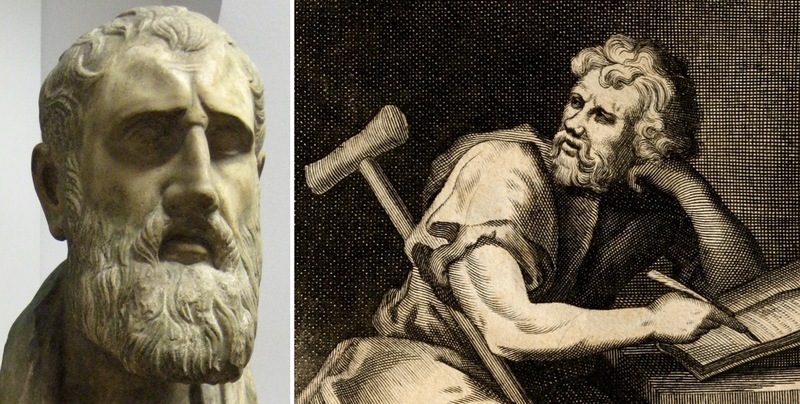 Regarding the discipline of action, it is noteworthy that Epictetus explicitly says that Stoics “ought not to be free from affects like a statue, but ought to maintain the relations natural and acquired, as a pious man, as a son, as a father, as a citizen.” So much for the stereotype of emotionless Stoics. And of the discipline of assent Epictetus tells his students that it is crucial if they want to make progress, thus “securing” the other two. The prokopton should not be surprised by unexamined impressions, ideally, not even in his sleep. Finally, what of the relationship between the fields and the disciplines? Here, as I mentioned above, the original articulation is due to Pierre Hadot, and it also comes through nicely in Don Robertson’s book, Stoicism and the Art of Happiness. The discipline of desire derives from our understanding of how the world works, hence from physics, and it is mediated by the virtues of courage (to accept the way things are) and temperance (in order to live well, without desiring what we cannot have). The discipline of action comes from the topos of ethics because it concerns how we should behave with others, and it is therefore mediated by the virtue of justice. Lastly, the discipline of assent is connected to logic because we need to use reason in order to grant or deny assent to impression. The exercise of which is the virtue of (practical) wisdom, or phronesis. I don’t know about you, but the more I contemplate the above system the more in awe I am of the ancient Stoics, and the more I become convinced that this is an eminently practical philosophy for modern times. This entry was posted in Ancient Stoicism on September 8, 2016 by Massimo. I’m not sure about using mindfulness for phronesis. Mindfulness usually means a vigilant attention to thoughts, impressions and emotions. Phronesis means using reason to judge the impressions right or wrong which is practical reason. I don’t quite understand the relationship between Physics and Desire. The other 2 relationships (ethics/action and logic/assent) seem clear to me but not this one. Can someone clarify this for me ? So, physics tells us how the world works, to the best of human knowledge. The discipline of desire has to do with what is and is not under our control, and to the first group belong things that we should desire, to the second group things that we should not desire. So physics tells you what is or is not proper to desire. I hope this helps! I find this difficult.You yourself have said that stoicism should not inhibit political activity. But political outcomes are not completely within my control, implying that I should not allow them to become objects of desire.How then do I remain motivated for political action? Stoics remain politically motivated because of th discipline of action, and the connected virtue of justice. But any given political outcome is classed as a “preferred indifferent,” precisely because it is not under our (complete) control. It is, to use Cicero’s memorable phrase, to be chosen, but not to be desired. It’s often anyone’s guess as to how the ancients meant the words they did, and often, scholars can only infer their connotation through context. So the word φρόνησις literally means “thoughtfulness” in the sense of applying thought and judgement to something. It’s not the same word as “wisdom” which is σοφία. But words often blur, so that σώφρων, which literally means “wisely thoughtful” is often translated as “prudent,” combining both roots. I think the intention on rational attention is clear enough and doesn’t require nitpicking. If you want to really go crazy, you can note that φρόνησις comes from the word φρήν, which means “midriff.” The diaphragm was originally considered the seat of judgement, not the brain, such that many words derived from a sense of thought emerged from this root, even long after the notion became obsolete. Are you sure Robertson refers to phronesis as mindfulness? Looking at p.28, in the “Key Idea” box on practical wisdom and virtue, he doesn’t. And in several places in the book, including the index, he refers to prosoche, not phronesis, as mindfulness. Thanks for the commentary, very helpful! You are correct, but I said that Don calls the discipline of assent Stoic mindfulness, not phronesis itself, so he sees a connection there. But, again, refer to what nano wrote. At least some formulations of mindfulness stress the importance of the absence of judgement whereas judgement is central to phronesis.